We may be a family of competitive eaters. Not for quantity, but definitely for quality. We have a tendency to call one another when we have eaten something spectacular. We send pictures, describe, dissect, boast about dishes we have had. When we can’t share food across a table, we don’t hesitate to share across phone lines or with e-mailed photos. So it came as no surprise when Bob sent us these. Sean, Aidan and I took a much needed break for two weeks (more on that later), but while we were gone, look what we missed. 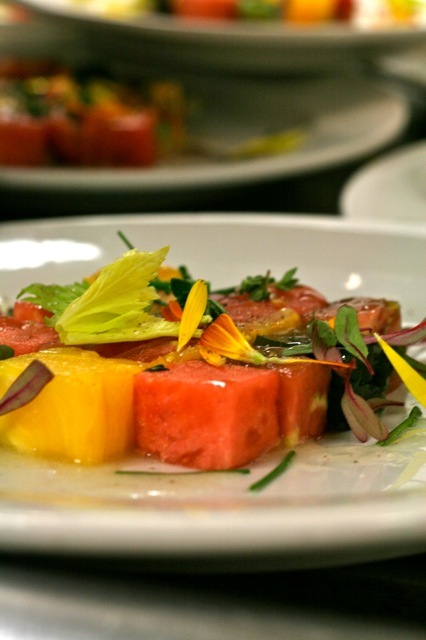 Justin Beckett, of Beckett’s Table, held a dinner celebrating our heirloom tomato season. 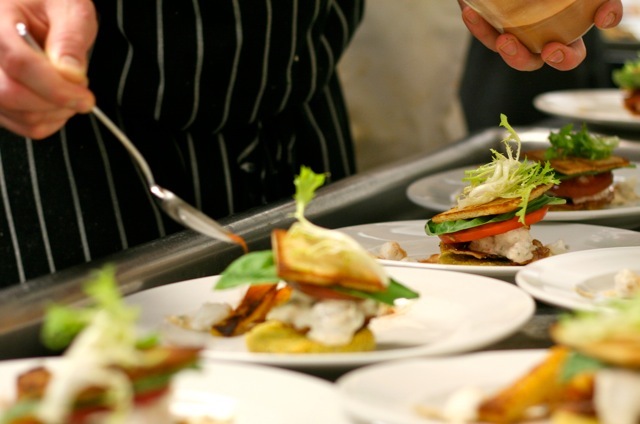 He created a menu of mouth-watering dishes, each featuring a different heirloom tomato variety and paired with an Arizona wine from the Pillsbury Wine Company. Heirloom tomatoes, tomato sunset terrine, watermelon & avocado, basil gelee, chardonnay vinaigrette, breakfast radish, herbs and flowers, paired with a 2009 Chardonnay. 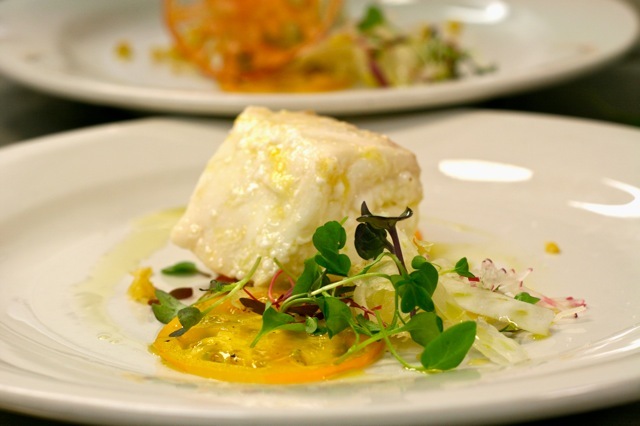 Olive oil poached alaskan halibut, shaved fennel, preserved lemons, tomato chips and petite lettuce, paired with a 2009 Wild Child White. 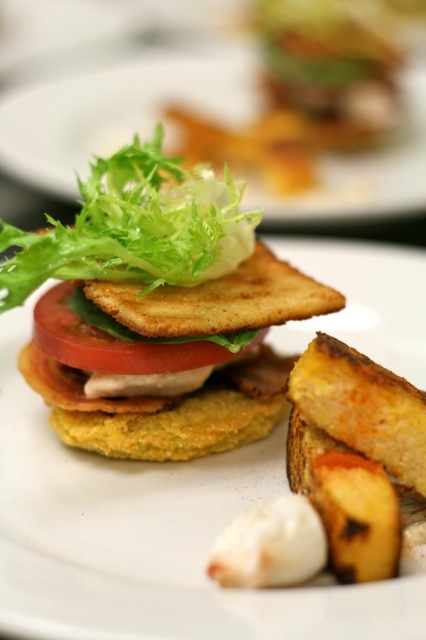 Cormeal fried green tomato, crisp brioche, roasted garlic spread, pancetta, frisee, tomato polenta fries, crab remoulade, paired with a 2009 Wild Child Red. 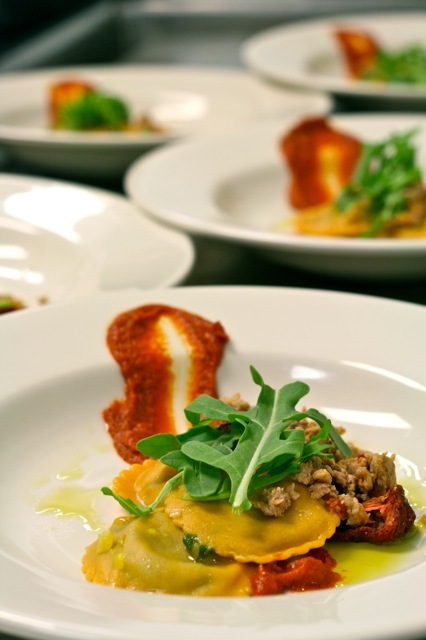 Arugula, Pecorino and Golden Bar Squash Ravioli, house-made chicken and pork sausage, solar oven baked tomato sauce, paired with a 2009 Diva Red. 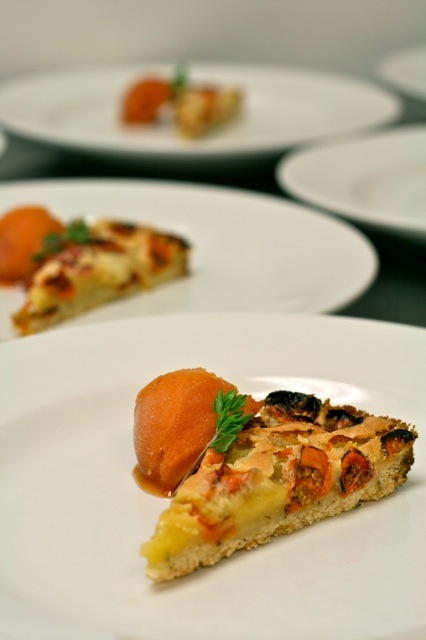 Thyme parmesan crust, tomato brown butter tart, house-spun tomato sorbet, paired with a 2009 Roan Red. We definitely missed out, but Justin was nice enough to share his recipe for the Basil Gelee that was served with the first dish, Tomato Cubed. Bob raved about the basil gelee, saying that only a small sliver of it with a bite of tomato was beautiful thing. I can’t wait to try it for myself. Blanch basil. Bring water, wine and sugar to a boil. Turn down to a simmer and cook for 2 minutes. Sprinkle gelatin on two tablespoons of water and let soften for two minutes. Pour 1/2 cup of the wine liquid thru a fine strainer into the gelatin mix. Blend remaining wine liquid with the basil and lemon juice till smooth. Pour into mold and chill quickly.